Looking to save money on private flights to/from Dallas? Charter an empty leg flight with Private Jets Dallas and save 20%, 30%—up to 50% or more on the cost of private jet travel! Dallas is one of the busiest regions in the United States for private aviation, with business jets and luxury planes flying in and out on a daily basis. As flight are booked at local airports, empty leg deals become available for savvy travelers who know where to look. Don’t know where to look? You’re already there! Call us anytime at +1 (888) 987-5387 and request an empty leg jet charter quote. Our brokers enjoy access to every charter plane available in Dallas, Houston, throughout the state of Texas, and across the United States. No matter where you’re flying to or from, we can find you an amazing deal with empty leg flights in Dallas, TX. What makes an empty leg? Flights on empty legs, otherwise known as a “deadhead”, become available whenever a one-way flight is booked, and a plane needs to return to its home airport. Likewise, deadheads can be created when a trip is booked, and the plane needs to re-position to another airport to perform its next flight. One-way flights are usually priced as round-trips, with clients responsible for covering the return trip. Since the plane is flying empty, operators will market the leg at a steep discount. After all, a plane flying empty is a plane not making any money. That’s where the savings come in—fill one of these empty legs and save up to 50 percent (or more) on the cost of your private flights! For example: a one-way flight on a mid-size jet at Love Field is booked to fly from Dallas to Los Angeles, with the return leg included in the cost. After dropping off passengers at Van Nuys Airport, the plane has to fly home to Love Field. This creates an empty leg flight from Van Nuys back to Texas. Clients looking to arrive in Dallas from Southern California, Phoenix, Santa Fe, or anywhere else along the way can have the plane stop and pick them up at the fraction of the cost. 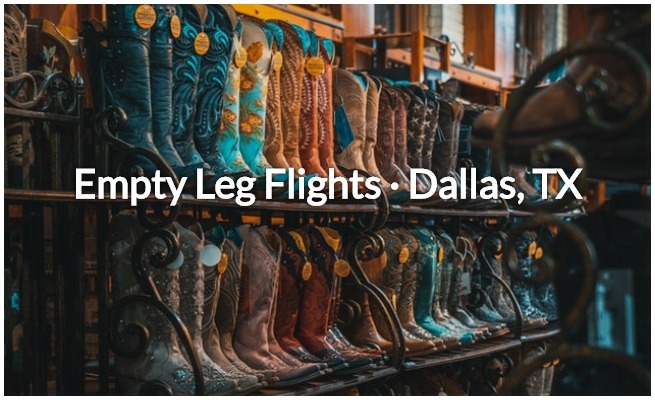 Looking for the best deals on empty legs to/from Dallas? The demand for empty legs has caused the market to become saturated with term, often used to draw you in. You can search for one in Texas on your own, but availability is scarce and operators that have them are limited to their own fleet. Want to know the best way to find one of these empty leg deals? Give us a call anytime, anywhere and ask us to find an empty leg for you! We have access to every transient plane available for charter, searching aircraft schedules coast-to-coast to find a deal that matches the routing of your flight! This also allows us compare empty leg costs for different aircraft so you always get the best deal. Are you a flexible traveler? The more open you are with the dates, times, and airports used for your flight, the most options you’ll have when looking for a deal on an empty leg. Aircraft schedules can change by the hour as new flights are booked. Even if we can’t find an empty leg near you, we still offer the best air charter services in Dallas with the competitive rates and the highest levels of safety & service. Request a free quote for your flight from our Dallas jet charter brokers. Our team works to find the best charter deals in private aviation for international flights, executive groups, special events, and more. Whether you’re looking for the best price on a one-way flight to/from Dallas or a short hop to Houston, Austin, San Antonio, or anywhere in the South, let us match you with an empty leg and lower the cost of your private jet travel! Find the best deals on private air charters in Dallas no matter where you’re located. Our services are available 24 hours a day, 7 days a week, and quotes from us cost nothing and come with zero commitment to book. 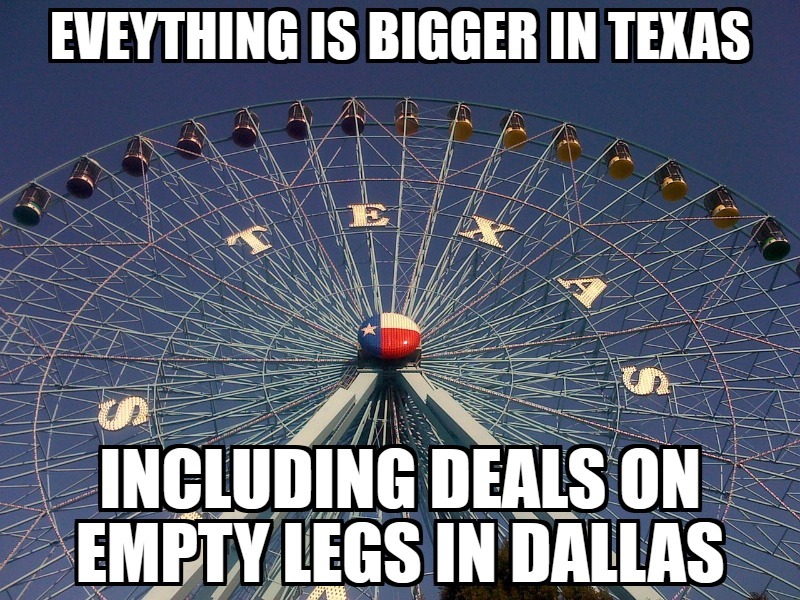 Feel free to contact us for an incredible deal on empty legs to/from Dallas, TX!